I am now about a week into my fourth month of service here in Zambia and in total I have been in country now for 5 1/2 months. I've covered 1700 kilometers. (That's 1054 miles for those of you who still have not figured out the metric system) on my bike, read 14 books, learned a lot of Kikaonde, started cultivating my hectare of land (That's 50 meters by 50 meters or 164 by 164 feet making about 2/3's of an acre for those that are still metrically challenged) tried a bunch of new experiences and made a lot of friends. Zambia is both an amazing and strange place to me, but it's beginning to grow on me and I am really happy to be here. I have added a bunch of pictures to Topher Chavis Photography. Check them out. 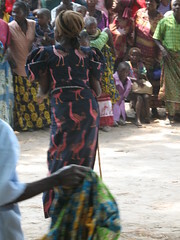 October 24th is Independence Day here in Zambia and Shukwe Basic, the school I live next to, had a daylong celebration. There was dancing, singing, drama, poetry and history. There are tons of kids in the town of Shukwe and they love to have a good time. Zambia was celebrating its 42nd year of independence since the end of colonial rule. The people are fiercely proud of their country and heritage and love sharing it all with people from around the world; like me. Back in September I had the chance to visit another part of Northwestern Province, Mwinilunga. I was up there for the annual Lunda festival, Chisemwa Cha Lunda. This festival is held at the end of the dry season to usher in the rainy season and bring about good harvest for the people in the coming months. We were hosted by Chief Kanongesha at his palace during the festival. The festival was a lot of fun. Great dancing, great entertainment and great people. It was the first of what I hope will be many cultural experiences here in Zambia.